For online movie rental enthusiasts, two applications are now available to manage either your Netflix or Blockbuster rental queues. 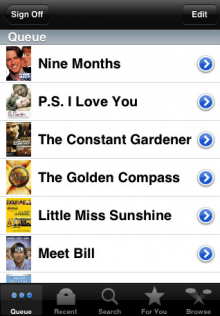 Add, remove, and reorder movies with a few easy flicks of a finger. You can rate movies youve seen recently, see ratings and descriptions for all the Netflix top lists, and even search for a particular title to learn more about it before popping it up to the top of your queue. Also provided is an extensive tutorial with screenshots on how to accomplish various tasks on the iPhone. The developer does offer a free version called Dashbuster Free [App Store] which does not allow you to add or change movies from your iPhone, and will incorporate ads in the future.